Trailer: ShoreLander galvanized trailer with brand new tires, working lights, and is included in the price. 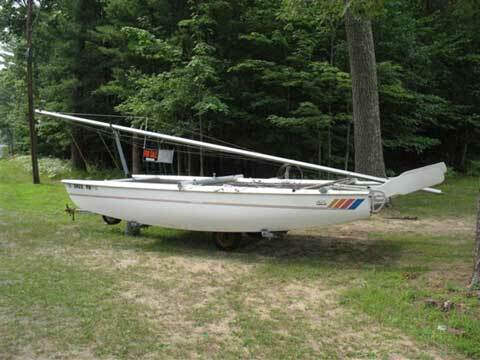 Hulls: Hand laid fiberglass, symmetrical deep-V hulls with no dagger boards provide excellent buoyancy and a smooth ride, even through choppy water. At 5.7 meters or 18'8 long, these hulls have their original colored pin striping, and include storage in each hull, accessed by a hatch. 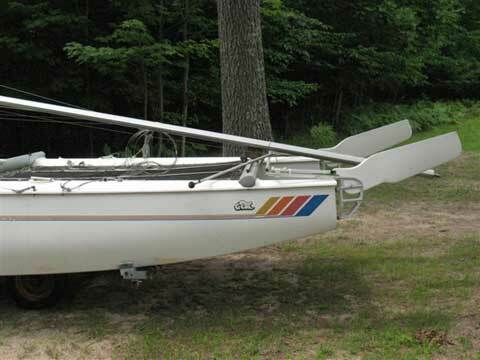 The hulls are anchored together by three cross beams creating a very solid boat, also allowing for a front trampoline in addition to the typical rear trampoline. Trampolines: Front and rear trampolines included which provides some 90 sq ft. of space for your family and friends. 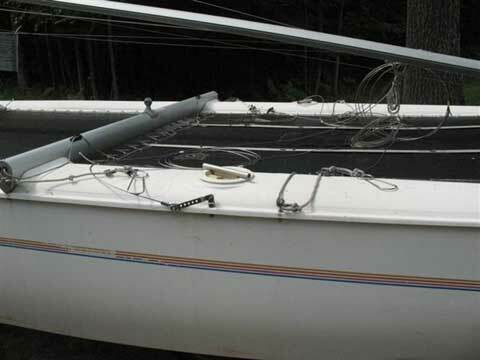 Rudders: This sailboat has excellent kick up rudders. One rudder has some cosmetic gel-coat dings and chips. Great control with a telescoping tiller handle when on the hiking harness also! 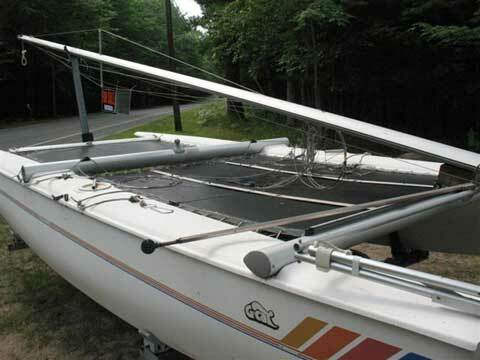 Sails: Original multi-colored sails in good condition. 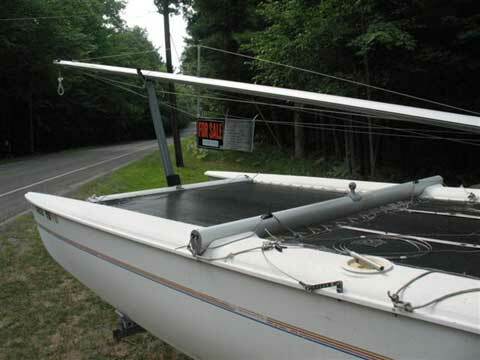 Includes both a jib and main sail for 235 sq ft. of sail area. Rigging: Complete rigging is inclusive in price, including all sheets and halyards, blocks and travelers. Trapeze and Harnesses: Includes two hiking trapeze wires per side with three "G-Cat" hiking harnesses. I do have the title for this boat.